You are a huge fan of subliminal messages, right? That is probably why you want to know this software better and see how it can help you improve the areas you are working on in your life using subliminal messages, isn’t it? Well, my subliminal 360 review will be having a deeper look into the software, much deeper than you will get in other reviews out there. It will be going into the software’s aspects like how it works, how to use it, what is included in the program, customer reviews, cost, discount codes and free downloads, the app, why it’s my #1 subliminal software recommendation and the bonuses given. I am very confident you will find this review helpful and addressing most of what you want to know about it. If there is a certain area you wanted to know that I might have left out, do let me know about it in the comments below and I will do the best I can to address it. Okay? This is a software that helps you use subliminal messages to help change different areas of your life. The software comes in the form an app that has over 350 premade subliminal messages for different areas like success, fitness, mental skills, sleep and relaxation to mention a few. These messages are meant to talk to your subconscious mind while you are doing other things on your device, and get to remind this part of the mind the things you want to achieve. As you keep using using these messages, your mind is trained to take in the messages being passed on to you and help you work harder to achieve them. 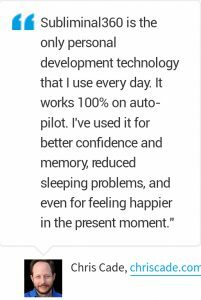 This software was created by Karl Moore, the owner of Inspire 3, which is one of the most reputable brain improvement company on the web. The company has also made other great tracks for many states of the brain. Some of their other systems include brainev, Brain Salon, The raikov effect (my favorite one thus far) and Sleep Salon. I have tried many of their brain programs and I have to say the owners really know what brain enthusiasts want. Their programs are really on point when it comes to quality and support. The whole software and technology behind the program is meant to work on your subconscious mind. It sends specific messages that stimulate this part of your mind and make it remember and keep putting in a lot of effort into hitting the particular targets of life you have set for yourself. These messages are sent very fast to your brain in a speed that only the subconscious mind will get. The conscious mind doesn’t get to see them, which is great as you only want to focus on the former to make things happen in your life. It helps you do this in two ways, through image flashing and subliminal mp3 files which you can listen to. • In the image flashing method, you get to use some of their subliminal messages which give you specific messages, positive affirmations if you will, to keep reprogramming your mind. 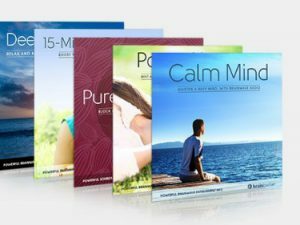 There are over 350 sessions for subliminals as well as over 4,000 strong affirmations you can choose from. The images of these affirmations will flash on your computer’s screen in milliseconds and hit the subconscious mind hard and fast. This will happen a number of times repeatedly, to give you the best effect. As you do this regularly, you will be able to have constant momentum to work on your goals. • The other tactic is through, subliminal mp3 music files. Here you get to choose the messages, either from the listed affirmations in the program or by custom making your own messages. After that, you choose one of the many background musical tracks and play them together with the messages. There are many background musical tracks like classical music, spa music and even workout tracks if you like. • Log in to subliminal 360 app. • Click on the “subliminal messages” tab. • Look through the huge list of prewritten messages. 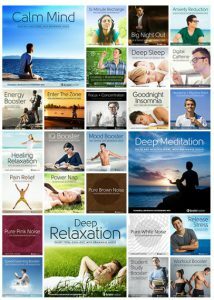 • Choose your preferred topic and the affirmations you find effective for you. • Click on “Start Flashing”. • Keep using the computer to work on your other projects and the flashes will begin. You can also create your own custom sessions by clicking on the “Custom sessions” on the app and adding your own texts and even add images to make the visual experience even better. • Choose the affirmations you want to hear. You can also create your own using the subliminal editor in the software. • Convert them into mp3 files using the software. • Select the background music you find interesting and that goes well with the affirmations you have chosen. • Play them and continue doing the job you were on, with your computer. The affirmation sessions in the program are safe for pretty much everyone. If you want to use them no matter who you are, feel free to do it. But there are other tracks the system has given as bonuses called the brain hacker sessions which are meant to change to your mental sates and cause sleep, peace, mind boost energy and other states. And this applies to all brainwave entrainment products out there. Please be wary of them and avoid them if you fall in this list. Inside the software, you are getting a little over 350 subliminal messages and more than 4,000 affirmations to use. You also get the ability to make your own subliminals which you can add your own messages as well as add inspirational photos which will also flash on your screen as you work. More to that, you get 25 bonus tracks I was talking about. They are called Brain hacker Sessions. They use brainwave entrainment that alters your state of mind and help you get into various states like sleep, calmness, reduced anxiety, creativity and many more. All these are valued at $350 but you are getting them for free. I love these tracks since their audio quality and effects are great and really do a great job. I personally used the sessions here and was very happy with them. I listened to most of the premade sessions and found them very efficient and worth the money spent. See? People are very satisfied with it. Actually, I have not seen a single complaint about it or any part of the program thus far. This means that this software is something safe and effective, which I highly recommend you try out. There are three versions of the Subliminal 360 program. The first one is the Amazing version, which is the most basic. 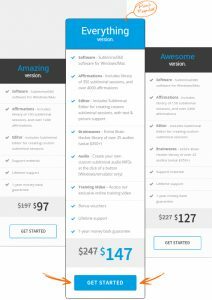 It comes with the subliminal 360 software which can be used in Windows and Mac, 100 subliminal sessions and 1200 affirmations, subliminal editor which helps you create your custom sessions, support material, lifetime support and a one year guarantee. The second one is the “Awesome Version” which comes with a few extra things on top of the Amazing version. 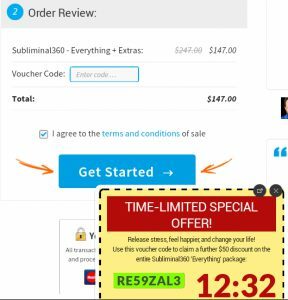 If you choose this version, you will get the subliminal software, 150 subliminal sessions and 2400 affirmations, subliminal editor, the 25 brain hacker sessions, support material, lifetime support and a one year guarantee. The third one is the “Everything Version” which is the most popular version of the program and which the creators recommend you go for. It includes the subliminal software, more than 350 subliminal sessions and more than 4,000 affirmations, the subliminal editor, whole 25 brain hacker sessions, ability to create your own audios, training videos, bonus vouchers, lifetime support and a one year guarantee. This has everything there is to offer in the system. You will get it on the bottom right corner of the sales page. Just copy and paste the code on the voucher code area of the purchase page and then redeem it to get the discount immediately. This means that the company is ready to give the highest version of the program at the price of the lowest version. This shows that they are more determined to see you get the best of subliminal 360 and are not really after your money as most other programs are. Frankly speaking, this is what makes me love inspire3 programs, they are caring and very considerate with their prices and the quality of their products as well. When it comes to discounts, I should start by saying that you have already been discounted in all the versions. But the third version has been discounted twice. You get to have it discounted from $247 to $147, and then you get to use a $50 discount code if you buy it today which lets you have it at only $97. These tracks are the ones which will fully convince you the program is great. I encourage you to download and listen to them. You will also get a free subliminal 360 tour to help you know the science and your way around the program, it is pretty interesting. Based on my personal experience and the high quality products you will find in the system not to mention the cheap prices and the many discounts you are also getting, I find this system to be one of a kind. That is why I have chosen it as my #1 subliminal message recommendation. It’s the best subliminal software out there. I believe you also see the reason why. And that marks the end of this subliminal 360 review. This software sure seems very promising. I’ve known for years how powerful subliminal messages are and have experienced them in very positive ways during my life. I really like the idea of being able to customize the messages (images/music and texts). In a way, I’ve been doing this manually in order to train my subconscious mind. But I can imagine how much more power and tremendous effect someone can get from a solution like the Subliminal 360. This sure is a really effective and cool program to work with. This sounds like an effective way to train your mind into feeling more motivated to work towards your goals. I might be interested in getting this as I think any motivation is good to continue going as well as using this to help fall asleep faster. I like the idea of being able to choose which affirmation to play along with a specific song in the background. My question is, which of the options do you think is the best deal in terms of the amount of content and the overall pricing? I think the “Everything version” is the best way to go. You are getting everything the system has to offer and the good thing is that you won’t pay $147, the marked price. You can use the timed discount code to get a $50 discount and have it all for $97. This is fair, as the simplest and limited version also goes for the same price. So using the discount offered right now will save hugely. Simply put, get the “Everything version” because it is cheap at the moment because of the discount. The other versions are more expensive compared to this particular version. Hope it is now clear. Dave, this information was new to me and very interesting. I tried clicking on links to read about the different options available, but none of the links worked for me. Have those not been set up? There was a bit of a problem with the links but it is all sorted now. You seem to have a lot of passion and knowledge on self improvement. I recently went through a rough patch in my life but affirmations and meditation helped me through it and now i’m as happy as ever. This program seems complete and very helpful. It’s also awesome that you can use it on an app! I will definitely have to check it out in the future! Subliminal 360 is a really great program and I am confident you are going to love it. Hi. I sure would like to improve my brain. Does it work on aging brains? I love the idea of it going so fast it bypasses your conscious mind and is only detected by your subconscious mind. It seems like a great program at an affordable price. I like the fact that they give you such a break with the premium program that it is the same price as the cheaper program. I also liked that you could download and try some of it for free to see if it is something you would like to buy. Thanks for a good review. And it sure does work great on any brain so you don’t have to worry if it will work for you. Whoa, this thing looks amazing. I know the importance of positive affirmations and sometimes when my self esteem is low I try to say as many positive things as possible to bring it back up. I also love the fact that I can use this with music so I listen to relaxing music while getting positive affirmations. I would like to share this with my 14 year old brother – you said it’s not recommended for people under 18 – do you have any advice what I can do in this case? You can use all the tracks with you brother except for the brainwave entrainment versions. All the other versions are great and very safe for all people. This means, if you want to give them to your brother, you can go ahead and use the other versions. If you also want to know how to get your brother to listen to the other brainwave tracks as well, you should make sure his mind is strong enough to take in the frequencies. And to do this, I recommend visiting a doctor before you start using them. This way you will avoid all the problems of using the frequencies on a weak brain. The thing is, most teenagers, not all, have weak brains which can be hazardous to tamper with as they are still growing and have not yet become mature. But there are other teens who are already strong enough to benefit from them. The most important thing is to know where his brain is in terms of strength. thanks for a great article Can I sign up for more ? like I suppose the picture should be of Size= facebook post size, Font = Arial, Font Color= Blue, Background= White, Position to blink on screen=Center. may I use different size, font style, background and position ? Is it ok ? plz give me some suggestions to make more varitions and freedom about it , also If I want to have a Smart Touch Screen Phone, so is just Picture of that phone is enough or I should I also write that I am using this phone ? what should be the blink time : like 10 milli sceond ? or 20 ? also what is the capacity of Subconscious mind to get the message like can I put a Picture of house n car & just write using image editor that I am having this house/car/bike , would it work ? I think the other best flashing software you could use is the Dream Manifesto. It has the the picture flashing provision which could work for you. I haven’t understood the other questions. Could you please elaborate more using clearer English so that I can help you out as best as possible? Please? Great post. Love improving my mind and the easiest way I find is through audio or audio and visual combined. You talk about the Brain Hacking sessions using brainwave entertainment. Is this similar to binaural beats? Could really do with some good affirmations to listen to and this seems to cover a lot. Might be my next “taking care of me” purchase. Yes, the brainwave tracks are similar to binaural beats. They use the same science, brainwave entrainment, which is mainly aimed at helping people get into better mental states than they are in at the time of their using the tracks. The tracks bring a quick mental shift, which is great. Do purchase them, I’m more than sure you are going to get immense value from them. I must say, this is pretty amazing. The technology we have access to these days are just unbelievable. They say the mind can be your best friend, or your worst enemy, and this goes right along with that saying. Sometimes we train ourselves to be negative negative negative, all the time, without even realizing we’re doing it, and it’s all because of the effects (or is it affects?) of our sub-conscious mind. I could see how this product would have people doubting it if works or not, but I have NO DOUBT that it would. As I am a believer of the sub-conscious mind we all have. Thank you for the review!! I’m glad I ran across this cause I’m surely getting it for myself. Your brain can either make you great or super disgraced. It has been designed to take in everything that we feed it, both good and bad. And if you spend most your time investing the good stuff in it like using the subliminal messages, the result will be a rewarding one that will bring you peace, harmony and happiness. That’s why I have taken the time to build this website to help people know how best they can get their brain to work great and in turn improve the quality of their lives, which is what we’re all after, right? I strongly advise you to use the subliminal 360 when you get it so that you can see the negativity and conflict in your life go away for good. The software seems like a good one. I had heard before about subliminal messages so I know the meaning of the term but they never used to work for me. What I like the most about this software is that you can choose the messages and images yourself. I don’t focus on training my subconscious mind in my everyday life, I only focus on working on my goals and I think that this also programs my mind in the process. But I find Subliminal 360 very helpful for someone who wants to program their mind. I will be surely checking it out. Thank you for the recommendation and detailed information! Subliminal 360 is something you are going to get immense value from because it will not only help you program your subconscious mind, but also help you achieve the goals you have set in your life. The thing is, flashing the subliminal messages constantly on your screen will keep injecting the goals in your mind and make them feel part of you. As this happens continuously, you are going to notice that you are becoming positive about achieving your goals and find them very easy to achieve. And when you have this kind of mentality, bringing the goals to reality isn’t a difficult job. Hi. In a second review I read that only the Basic Version is fit for Mac! The other two, like Awesome, cant be Played on the Mac. Is this true?? All the versions of subliminal 360 work great on any Mac with the El Capitan version upwards. The only issue you might get when using a Mac is creating your own subliminal mp3s. This is still being worked on but is not accessible at the moment. Other than that, you shouldn’t have any other issues. If you have more, send them my way and I’ll help where I can. But is there limit for how many affirmations to use in each recording? The mp3 file for custom subliminal is 10 mins. And whatever number of affirmations I record, I get the file 10 mins long. We don’t know if the affirmations are repeated or not or even if the app ignore some affirmations if I added many like if I added 50 affirmations. Cuz it is strange that the file length is 10 mins always regardless of that you used 4 or 10 or 50 or 100 affirmations! Well. The software is designed to allow you to create custom subliminals that last 10 minutes. This means that the number of affirmations you feed as you create them will be created to last for 10 minutes. If you give it more affirmations that will take more than 10 minutes to play, they might get overlooked and only get the ones that will fit the 10 minute range. If you need more help please let me know and I will be happy to help. Gosh, this seems like it’s a pretty good idea. I’ve often tried to find good subliminal messaging programs. And this seems pretty good. I’ll have to look into it more. I do like the way that it’s customizable and that they offer so many different options for you to get the messages that you desire for yourself. Thank you so much for doing this review! It really gives me something to think about! My mission has always been to help folks get what they would want, or perhaps better in brain improvement. And knowing I am doing this for you, makes me glad. I really do encourage you to dig deep into it and you will see how good of s subliminal software it is. Well I must say I could use the ones for sleep right now . You mentioned this has over 4000 affirmations do you get to see what they are and if so can I assume you get to choose which ones you want? I didn’t see it stated anywhere. Have you had any success with subliminal s ? I have not used them but a couple times so I was wondering the long term use if they really work as stated? Yes, you do get to see the affirmations that you will be working with, and you will also be choosing the ones you want. Subliminal messages have been a great part of my life since I can remember and I have had huge success with them throughout the years. 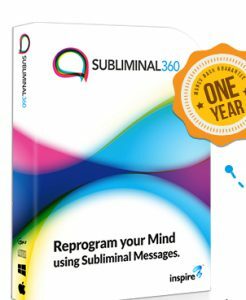 If you have not used them before or perhaps you have had a bad experience in the past, subliminal 360 is one program I would really encourage to give a chance. I’ve used subliminal messages for some time now. I’ve seen some results, but not the dramatic results these programs are promising. Probably it’s because i want to do everything at once 🙂 Also, sometimes, when using brainwave technology, I feel my brain overwhelmed and tired. So, what, in your opinion is the optimum, as well as the safest way to use brainwave technology and its products? Well, subliminal messages are great and they do work but I also agree that at times, programs over exaggerate the impacts. But what I have seen is, during your first few weeks, you won’t notice dramatic results. But after a few months of consistently using them, some of the great changes start to happen. Subliminal 360 is one of the subliminal softwares I have seen do a great job. It does work and it is actually the most comprehensive program on subliminals that I have seen thus far. I would really encourage you to try it out and then let me know how you find it after 3 months. When it comes to brainwave entrainment, I would say it depends on the mental state you are after. There are many different brainwave entrainment systems for different states of the mind like sleep, meditative, concentration, focus and more. The program I would say I have seen do a good job in terms of relaxing and bringing deep meditative states is Zen 12. Brain evolution system is another great program I would recommend you check out. Regarding subliminal messages and audios, how would you suggest proceeding? Picking one category for improvement and focus on that, or have subliminal messages of various categories (money, health, self-improvement) simultaneously? I said 3 months on the maximum. This time period should have covered even the one who has slow response to brain systems. This time range is not limited to everyone. There are folks who get results in 4 weeks, others 2 weeks and even others in days. I think it all boils down to how receptive your mind is. When it comes to choosing the format of use for the software, I would also say it depends on your main purpose of using the software as well as your taste and preference. Personally, I would take an aspect I really want to be better at and get all the subliminals for it. I would also get related subliminals for that and work on them too so that I make the best use of them in that area. After that, I would pick another area and do the same. You can do that too or follow a design you feel best fits you. There is no specific format when it comes to using it. If you need more help be sure to let me know. I believe this subliminal 360 program is very interesting and definitely something to consider. I’ve never heard of the technique but of subconscious learning and such. The setup seems to be very valuable to people doing hard work and having limited time to relax. I’ll try the 5 free downloads first and test how this works. I always like if I am able to try something for free, it convinces me even more that there is a quality product in charge. The free stuff is what makes the best assessment of the product to help you know what you are getting yourself into. And I think that is why Inspire3 gives them. They know the program is great and wants to assure everyone by giving them a good taste of it. Do give it a try and let us all know how you find it Stefan. We will be waiting for your feedback on it. This product appears at face value to be very attractive in treating a lot of today’s afflictions such as stress etc. I would however be very hesitant to allow free access to my mind without knowing exactly what is being put in there there. Can you possibly elaborate on the parts of the brain that will be accessed and what sort of messages will be transmitted to that part? Firstly, it is great having you here. When it comes the Subliminal 360, the part of your mind that will be accessed as I have mentioned in the post, is the subconscious mind. This is where your beliefs, perceptions and values and personalities are. And through strong positive affirmations, your subconscious will be made to let go of the negative aspects that are currently holding you back from what you have always wanted to be and get to where you would want. You are going to love the program. Please remember to let me know how you find it. as a person who is very into lucid dreaming, medidation and subliminal messages, I am always on the look for new and exciting ways to expand my knowledge and learn something new! As far as Subliminal 360 goes, well, it looks to be very promising. Right of theb at I am very impressed by the amunt of content presented here with Subliminal 360. I mostly excited for Deep Meditation session, Deep Relaxation Session and Energy Booster Session. The orice is also pretty good in my opinion considering the amount of tracks, affirmations, sessions and other goodies that come along. Thanks for such informative review, I found it to be very helpful and enjoyable, keep up the great work Dave! I am very glad to hear you found the post useful. This is what I am always striving towards. Getting the best and most informative post for my readers. I also agree with you. The program is well worth the price if you keep in mind all the great stuff it comes with. I am confident you are going to have a really great experience with it. I knew these kinds of things exist for your mind, but never knew it was also in this form. In the world of today, many people are stressed or have problems because of everything. So I have the idea this works, as I see the reviews, to have a better mental health, more focus and more relaxing. I will order it and then I will tell you if I liked it or not. The programs do exist, many of them actually. But most of them are not quite up to the standards. That is why I recommend getting Subliminal 360 because it is the best one on the market at the moment. Do give it a go and let me know. I will be waiting for your feedback on it. I encourage you to give it a trial and I am sure you are going to love it. It is as good and worthwhile as it sounds. Do tell me how you find it after the trial. I think that the subconscious mind is incredibly powerful. Advertising companies have use subliminal messaging to stimulate action by planting the idea in your mind. If they can use it to get you to buy stuff I see no reason why you can’t use affirmations to drive yourself forward. When you focus on something enough your subconscious starts to internalize what you feed it, so if you are consuming positive information regularly your subconscious will start to implement those words. The brainwave entertainment sound very interesting. I think this will definitely be worth a try! You are right. Advertising companies have really been skillful nowadays. They found out the power of subliminal messages and they have been using them on folks without them knowing, no wonder the conversions are going up by the day. Subliminal 360 works pretty well and I am confident you are going to find it very interesting and effective. Thanks for providing us with this great in depth review of the Subliminal 360 product! I’ve heard a lot about subliminal messaging and the potential power it has for the brain, but I’ve never considered buying a product like this before. What is it that sets this product apart from the free alternatives? Such as resources on YouTube? Is it just the ease of use; everything is all in one place? Thanks again for sharing! The thing that set subliminal 360 apart from the resources on YouTube and the rest out there is quite a lot. First, subliminal 360 is the only software that has the best visual and audio subliminal messaging thus far. You can research on that to confirm. The other thing is the tracks and areas it covers. It has almost as twice as most of the program out there, with the benefit of being put all together in one place giving it the extra edge. Third, is the affirmations the program has used. As I might have mentioned in the post, the affirmations used in the system are really targeted and specific to the areas you are working on. They use words that folks normally to inspire themselves more. You are going to see that when you get to use them. There are other many reasons which are self explanatory. Please let me know how you find them when you give them a go. It is the first time I hear about image flashing and how it can help to reprogram the mind. I first tried these type of products to help me sleep better as I was struggling with insomnia. Our subconscious minds are powerful, and if we can find a way to change it we will have more power and control over our emotions and habits. I think Subliminal 360 is a good product that can help people do just that. Our subconscious mind is really powerful and it can be quite beneficial to work hard on it as it will go a long way in helping you build control over your mind, body and life. I have also heard a couple of people say that used it for bettering their sleep. And while it works in that area, I would recommend using Inspire 3’s Sleep Salon Program instead of Subliminal 360 as it has better results. I’m doing morning and evening meditation after yoga practice. The software seems to be very well structured and easy to use. I like how you present the product in details. How different is Subliminal 360 compared with mediation practiced in yoga? I know my self with sleep issues, I mean it takes a long time to fall asleep, is Subliminal 360 helping in this case? Well, the subliminal 360 program will be of great help in helping you create good habits that will build you up using subliminal messages. It is going to come in handy for you as far as meditation goes as it can help you change your beliefs and habits of being a restless person to a person who is calm and meditative, and then some. It may also work fairly well with helping you sleep, but I would rather you go for Sleep Salon for sleeping issues as it does a much better job. If you need more help, please do let me know below. I’ve never heard of subliminal software ever. This caught my eye because I’m looking for ways to improve my sleep habits as they are terrible. I’ve been dealing with insomnia on and off for most of my life. I’ve tried all sorts of natural remedies to help with this and some of them do work. However, since I became pregnant, I’ve had to stop taking anything as it could affect the baby. This might seem like an odd question. But do you know if this is safe for women who are pregnant? I really hope this is safe because this looks like one of the best options I have found yet. Thanks for sharing this post! Well, the subliminal messages you get from the software are not in any way dangerous to you or the baby, if they are only what you are going to use. Please keep away from the brainwave entrainment bonuses that the program comes with because they might have some risk. But you can confirm with your doctor and see if you can work with them as well. Subliminal messages are what we tell ourselves in our minds to encourage ourselves, and sometimes hurt ourselves too. If you watch tv, you must have experienced a lot of subliminal messaging as it is now used to incline people to buy products. These 2 have not hurt you thus far, which means you also won’t be hurt by the ones in the program as they are pretty much the same. But if you feel unsure, you can still consult your doctor to get their approval and put your heart to rest. Do let me know what you decide and how things go for you. I’ve never had experience with subliminal messages (other than every commercial on TV) and the power of their intended response. I have a very habitual daily routine and I find that if I do the same things every day (or as much as possible) I am more productive. These daily habits range from the time that I get up (I get up the same time, even on days off of work), to what I eat and when, to my evening routine at home with my family. In summary, I am a rather predictable person. I get obsessive about things and this can affect my routines, but I usually find a way to incorporate and adapt my routine. Do you think that something like this would be beneficial to me? Or would there be some adverse effects due to my nature? You are going to get lots of benefit from using subliminal 360 as it helps folks get good vibes, attitudes, positive thinking and work on creating good habits for themselves. If there is anything you are struggling with at the moment and are working on making it better, subliminal 360 will come in handy for you. So the program makes the perfect fit for you. Give it a go and you will see what I am saying. Be sure to let me know how you find it. Wow, I did not know there was technology like this to help with such huge parts of life. It is a really cool concept to be introduced to as I am always looking for ways and thoughts to help me grow. It’s crazy to think things like this can really change your mind, thoughts and life but it really clues you in to how amazing how brains actually are. Thank you! Programs like these are what show you how powerful your brain can be. The fact that you are able to change your whole experience of life through a simple program is mind blowing. I highly encourage you to look into it and let me know your experience with it. Please be sure to give us your feedback on it. Hi, Dave. I am interested in the other product in the picture “IQ Booster”. I have a daughter with the special need. She is 9 years old but she can not read, write, and count fluently yet. I got a bleeding when I was pregnant. Do you have a product recommendation to help my daughter? Well, I would advise you to go for the subliminal 360 and get to use the affirmations of self growth and development to help you child over the problem. Use the affirmations that work around, “I am intelligent!”, “I know how to read, write and speak fluently” and give it good time to change her subconscious mind. A few weeks from now, you should’ve seen some improvement. Keep at it until you feel she’s fully over it. Do let me know how it goes with her after some weeks. Hi Dave! Great review. I used to listen to subliminal messages a lot two years ago, and I found that it helped a little with allergies and my health, but not so much. I have never used Subliminal 360 – in fact I had never heard of it. This product is quite expensive, but maybe it’s worth it? I’m gonna try the Free Brain Hacker Mp3 and see how it goes after that. I’ll let you know if it make me feel any different or not. Thanks for making us discover this product anyway. Great to hear that you have been on subliminal messages before. Well, I don’t know which subliminal products you used before, but I know for sure that subliminal messages are meant to bring qualitative change in your life. You mentioned that subliminal 360 is expensive, which made me think that you probably used a cheaper program. The thing is, most programs that go for less in terms of price tend to offer low quality results as well. It is as they say, you get what you pay for. Subliminal 360 has quite some price tag but the quality that comes with it levels what you pay for it. Do give it a go and let me know how you find it. Agreed? We’ll all be waiting to hear from you. I already tried something similar to this and it gave results. Of course, people should use it on the way that is good for them – like 5, 15 minutes, or 1 hour… it’s great that there are different sessions, I love that. It’s gladdening to hear that you have had amazing results with the other subliminal products. This means you know that it works and you also know the kind of changes you can get with the technique. I do encourage you to look further into the program I’ve recommended and test drive to see what to expect when you get the program into full gear. I look forward to hearing about your experience with this program.